Squeezed a late visit to Dru in tonight, from 7pm til 8.30pm. 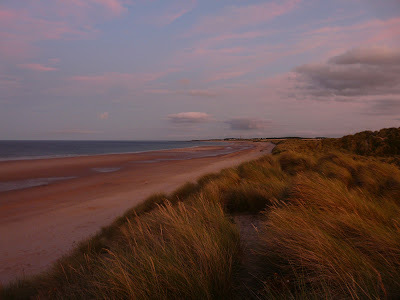 It was nice night with a pinky sky at dusk, though spoiled a little by a blusterly westerly. There were lots of hindurines, mainly swallows, about. It was tricky to tell if they were moving through or hanging around and feeding, anyhoo at times there were a couple of hundred in the sky looking west from the dunes. I picked a swift in amongst them too, nice late record. It looked really good for a hobby.......a peregrine would have done, but I had to settle for a kestrel. 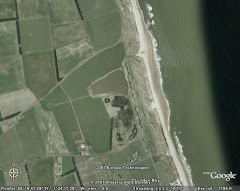 On the beach there were two gulls roosts offuv the patch and another larger roost further north offuv East Chevington. I counted about 1650 commun gulls (give or take a hundred or three) and I bet there were another 2000+ offuv Chev. Other gulls were few and there were only 10 or so arctic tern and a few sandwich terns. I was quite enjoying going through the gulls and terns until some bloke and his fat wife decided to run through them with their dog, clapping...grrr. Very little offshore....It's forecast to be good weather at the weekend, so the gull-scaring plebs will be out in force no doubt, oh and the honest romany folk are still camping to add to the joys of birding Dru. 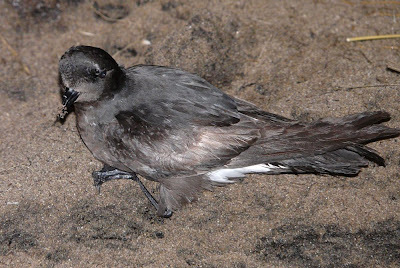 Went ringing stormies with Ian Fisher last night, we caught 7, 6 newuns and a control, so defo worth going out. Whats this rumour of an Aquatic Warbler being seen near the budge screen at the weekend? aquatic warbler, desert wheatear.....what next?